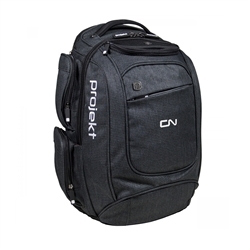 This Projekt backpack & Laptop Bag has many features. Crush resistant fur-lined valuables pocket. Top entry fur-lined laptop compartment. Padded iPad | tablet | e-reader pocket. P-Shox™ adjustable shoulder straps. Ergonomic back panel. Hidden side hydration pocket. Top custom injected soft grab handle. Military grade zippers. Adjustable sternum strap. Elastic webbing containment loops. Organization panel. Dark charcoal bag. Embroidered CN logo on front panel.